For over a decade, the ASL 5000 Breathing Simulator has been an essential tool for product development and quality control in the respiratory device industry. With the recent development of the Test Automation Interface (TAI), life just got a lot easier for a group of test engineers at CareFusion. The TAI is a feature of ASL 5000™Software 3.4 or later which enables users to integrate the device into their proprietary software for automated device testing. Mark Blair, Sr. 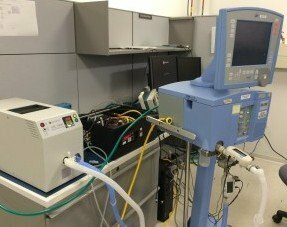 Principal Test Engineer at CareFusion, uses the ASL 5000 for product verification. According to Mark, the use of the TAI in combination with the ASL 5000 “allowed us to automate our product verification test set-ups and data acquisition.” He believes that the time savings and increased efficiency has been extremely beneficial, but he was quick to point out another major advantage of the system. The TAI comprises a set of commands which control the ASL 5000 software from within a separate test software environment (i.e. LabVIEW, C, C++, etc. ), a critical prerequisite for automated testing in product development and quality assurance. Learn more about the Test Automation Interface.